SecureVideo - How to look up Geolocation? SecureVideo tracks approximate location of connections for you, using the IP address of the connection. (IP addresses are then hashed.) IP address approximation is imprecise and can be greatly inaccurate if a user connects through a proxy server or otherwise masks their IP address, but can be useful as a general check on geolocation. This support article goes over how to look up this information on your account. If permitted by your role, you can also look up the geolocation of other connections made on your account. 1. Click on the "History" button underneath your participant's name. 2. An approximate geolocation will be present next to any connection attempt logged. An accuracy radius will also appear in parentheses. 1. Click on the profile icon in the upper right hand corner and select "Reports" from the menu. 2. Under "Geolocation", click the "Go" button. 3. If you have access to other users' history, the search will default to "All Users". You can click on the arrow in the "Session Host" role to search for other users. If you do not have this access, you will only see your own name in the drop-down menu. 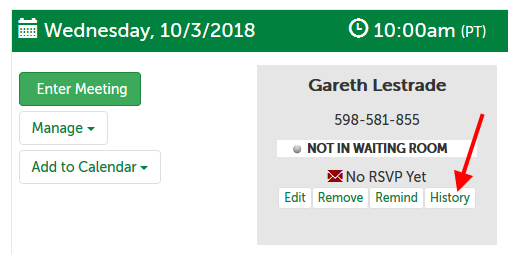 Set a "From Date" and "To Date", and click "Filter". Leave "From Date" and "To Date" blank to search for connections from all time. Leave "From Date" blank to search any time before "To Date". Leave "To Date" blank to search any time after "From Date". Use the "Export to Excel" button to export results as an Excel spreadsheet. 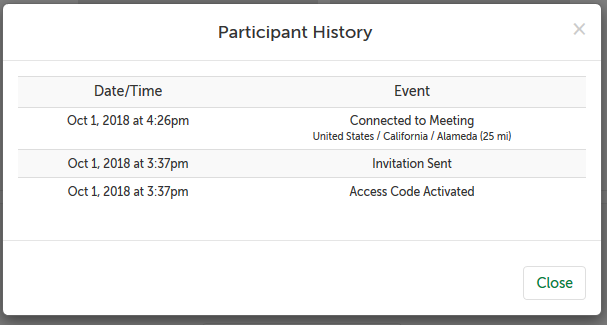 Session Connection Time: the date and time (using the timezone on your user account) the session started or was scheduled for. Session #: the SecureVideo session ID number. Host: the name of the user that hosted the meeting. Connection By: name of user (host or participant) that made this connection. Country: name of the country extrapolated from the user IP address. Region: name of the region/state extrapolated from the user IP address. City: name of the city extrapolated from the user IP address. This article was last reviewed by our Support team on October 1, 2018.